One day, when I was in the middle of another sewing project, I suddenly got inspired to make a chain cover for my dining room chandelier. It seems like I get inspiration for my projects all at once! I either have no ideas, or tons of them! I can't say that I had even thought much about covering the chandelier chain before, but that day, it seemed like a great idea. This is really easy, and you could even do it without sewing if you wanted to! First, cut your fabric to about 7" wide, and double the length of your chandelier chain (mine was 13" long, so I cut the fabric to 26"). I got this fabric as a remnant on clearance at Joann's for next to nothing! I didn't have any specific plans for it, but when I decided to make this chain cover, I thought it would be perfect! Pin all edges, and sew (or use hem tape). Cut your velcro into thin strips, pin it, and sew (or iron) onto your fabric. You'll want one piece of velcro on the outer side of the fabric, and the other on the inside, as shown below. Now you're done! Just wrap it around your chandelier chain and secure the velcro. The fabric will bunch naturally since it is longer than the chain itself. Even though the exposed chain never bothered me before, I really love how it looks covered. I think it's more finished and the gold fabric makes me happy too, and ties in with a few other gold elements in the dining and living room. Thanks Mary Ann! Hahah I was thinking the exact same thing! 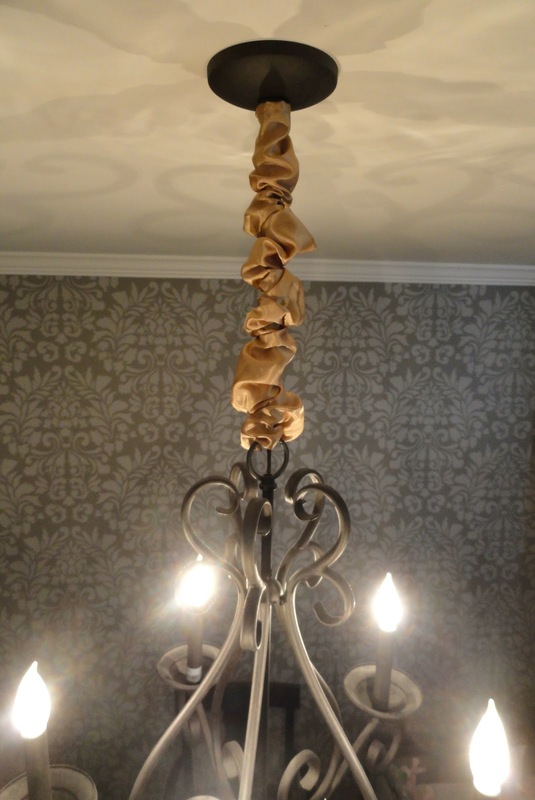 It totally is a chandelier scrunchie! Nice job! 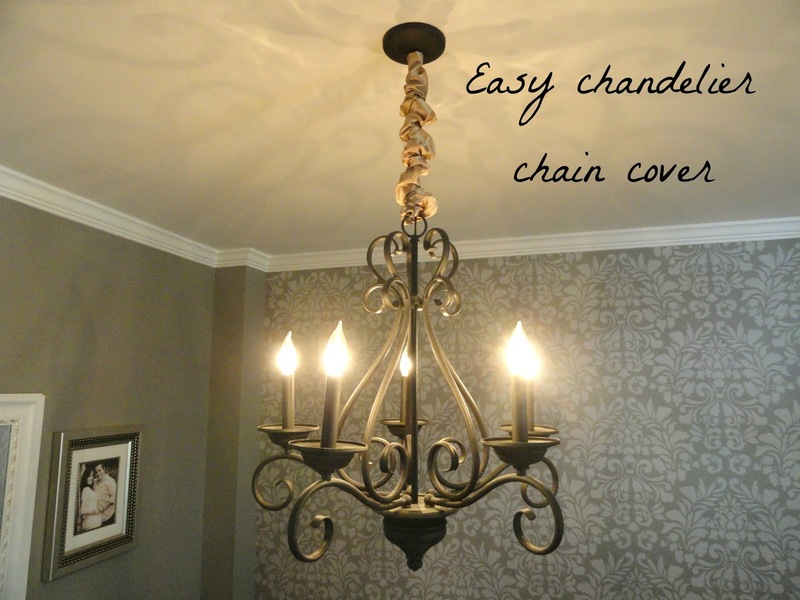 I love a chandelier cover and it's so easy to change with the seasons and/ or our moods! Thanks. Great tutorial! Perfect for me since I am planning on using a silky fabric as well. 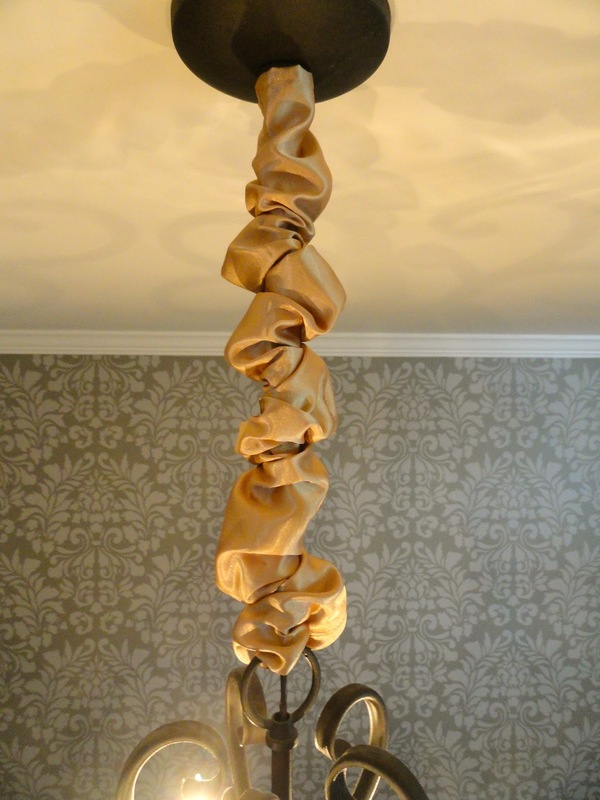 It looks great on your chandelier! pretty cool and allot better than paying $20 at Pottery Barn!!! Rachel's Nest featured on Veronika's Blushing!